Last night, I had a very profound dream of Lord Skanda. I dreamt that I was in a temple and saw lots of people gathered. There was a puja in progress for Lord Murugan and it involved going around the temple with a kumbam. I saw and heard drummers play music on the mridagam. The priest conducting the puja was carrying the kumbam around the adhimoolam (the main structure where the deity resides). I don't remember whether or not I followed them, but I remember watching the priest and Bhagavan Sri Skanda. After circumbulating, the priest faced the main deity, Lord Skanda. 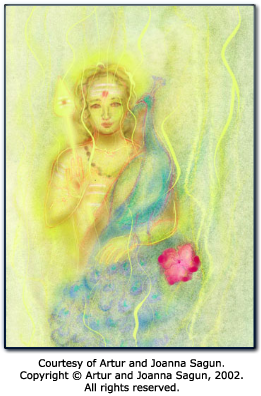 My beloved Sri Skanda was golden in colour and had a vel and a myol. I did not see Valli and Devayanai. The priest then took a pink flower and threw it as a offering to Lord Murugan. My focus was Murugan's feet through the entire time I was there. Immediately, everything around Murugan turned into flames. Bright golden light was the colour of the fire I saw. However, through it I could still see Murugan. In fact, the statue of Murugan only shone brighter, unharmed by the fire. Then the priest, who looked like he was in a trance, turned to me and said [in Tamil], "Go and give food (annadhaanam) to all gathered here." I immediately obliged by getting the plates of food and serving the people. I then awoke. And get freed forever from all Karmas, soon. "O mind, (by taking the unreal, fleeting things of the world as real) you stand to suffer! Now, listen to this means for attaining salvation: Without holding, give in charity; (and) meditate on the Lotus-Feet of the Lord having the sharp Vel! (By so doing, you will) burn to ashes the long-persisting misery of birth and death; and soon get freed from all Karmas." Why was I mentally and physically fixed on Skanda's feet? What was the significance of the fire? What was the meaning of the serving of food? The offering of the flower by the priest? If you understood the above verse, then the dream should make perfect sense to you. The fire was Murugan showing me that as the above verse states, if I keep my mind always fixed in contemplation on Murugan's Lotus-Feet, Lord Skanda will burn my karmas to ashes. By giving unreservedly to charity and serving selflessly, such as giving food to Murugan's devotees, that itself is an offering to the Lord which He will accept. Thus, Lord Skanda wants me to give of myself selflessly towards charitable deeds all the while thinking of His Lotus Feet. In doing so, He will burn to ashes and free me from all my karmas. This dream shows the truth behind verse 7 of Saint Arungirinathar's Kanthar Anubhuthi. What can I say of this? What can be said of His Graciousness? The Loving Lord out of His infinite compassion comes and shows me the secret to attaining His Feet. My Dear Dear Dear Bhagavan Sri Skanda. How you continue to care for me and guide me! Me a fool, who doesn't even know Tamil, an ignoramus! Yet, you still accept me with all my faults. What can I say? Words fail me at this point to express how much love I have for you.